Why should you visit Barcelona in Autumn? Autumn is my favourite times to travel to most city locations. This time of the year is a transitional time - just like in Spring. There is a magic in the air as the seasons start to change. 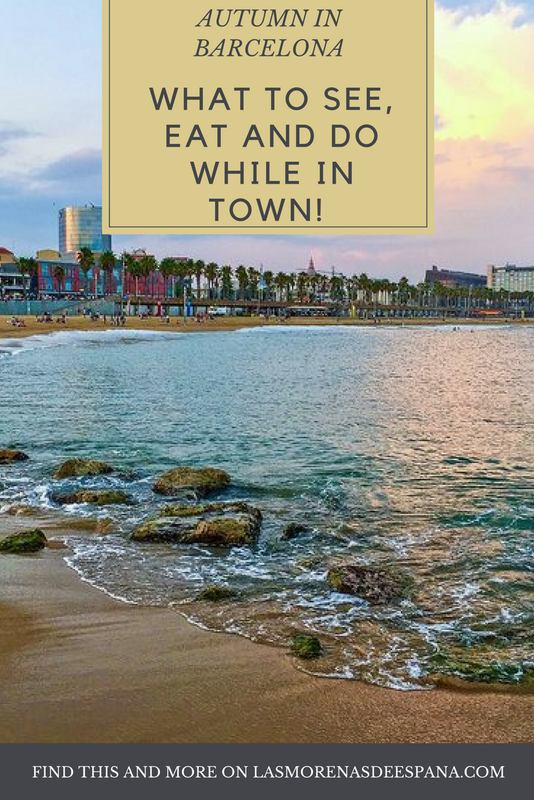 As with most mediterranean spots, coming to Barcelona during the Autumn is a perfect time to really experience the city and what it has to offer - with added bonuses! Speaking to many locals and expats who now live in Barcelona, it seems to be an agreed point – Every Autumn, they all breathe a sigh of relief as they get back to their usual routines, without having to dodge the huge numbers of crowds. Barcelona is a city to walk, bike and get active through the streets to travel. There's nothing more enjoyable than just having space to take your time and enjoy the city fully. The last thing you might want to do (especially in the Summer heat) is limit this by being in packed crowds and joining large queues to see city attractions (or even to get a coffee!). Most locals will head off to have their holiday outside of the city - So essentially, Barcelona feels like one big tourist playground during the peak times. But all of this changes as locals return to their normal routines and it’s a great chance to experience life as a local again. Want to experience Barcelona like never before? This guide is for you! With over 70 pages of the best parts of the city, you won't need a tour guide! The wonderful thing is that the weather is still gorgeous - with the added bonus of not being too hot. This makes walking, biking and cycling the city during the day much easier - without having to deal with the intense heat. It feels refreshing to see the difference after the holidays have passed - As the peak season ends in Summer, it’s a good time to buy travel tickets for the Autumn period where offers are available. Things like flight tickets, hotels and some tourist packages come down drastically in price – yet you can still have all the benefits (and more) of the Summer period. If you decide to explore more of the local region, this is also a wonderful experience to get out into the mountains or the coast by train, car or by other cheaper methods. Many cities and towns that are by the sea can lose their identity or become ghost towns after the tourist season is over. Not Barcelona! This city is so much more than just beach life. All year around, there is plenty of things to keep you busy. Autumn is the start to a whole new host of events to enjoy! Barcelona always promises many festivals throughout the year. This is one of my favourite ways to end Summer with a bang and welcome in Autumn. Barcelona La Mercè officially first took place in 1902 and lasts for around 4-5 days. It honours Mare de Deu de la Mercè, the Patron Saint of Barcelona. The city comes alive with lights and parades of fire breathing dragons, devils, Castells (human towers) and giants of kings and queens. Not to be missed! This is another local festival to enjoy! It takes place at the end of September where you can connect with local culture, music and people. Explore the Old Town and more firework displays. This is a wonderful family event too. Barcelona has many green spaces to explore. lots of the time, the beach can become a main focus for people who visit the city. But don’t forget that there are so many parks and mountains to get lost in! Autumn changes the way the city looks - Deep reds, oranges, yellows, the mix of warm and crisp winds… The beautiful sights, sounds and colours of Autumn brings out the best of this city. For this reason alone, I would definitely recommend spending some time in nature to soak it all up. Get a panoramic view of Barcelona - Park Güell, The Carmel Bunkers (Parc Del Guinardo), the Montjuic hills and the hills around El Castell de Torre Baró are some of my favourite nature spots with gorgeous views. If you want to dive deeper into nature, try the Ronda Verda cycling route (click here for website) - This marked cycling route will literally take you all around the city, through many different landscapes. The Ronda Verda is a circuit for cyclists crossing the great natural features of the Barcelonès county. It is a circular route consisting of six main sections - Enjoy a full on cycling and hiking experience. Or take your time with each section. If you like cycling and walking, you will love the sports events that Autumn in Barcelona. For starters, who can forget FC Barcelona football? Autumn is the start of FC Barcelona’s season and it is practically a religion to support this football team. Looking for a healthy guide to Barcelona? You got it! Get your jazz hands out in October! There are many music festivals throughout the year and Autumn is all about jazz. For over four decades, The Voll-Damm Barcelona International Jazz Festival has attracted the top musicians in the world. There is a whole range of venues and ticket prices, spread out throughout Autumn to suit you. Catalans are proud of their culture and language. In Barcelona, you will experience the “tourist side” of this city - but you can also experience the local Catalan culture. September 11th is La Diada, the National Day of Catalonia. It celebrates the country’s rich history for 127 years. To mark this cultural celebration, there are plenty of events to attend throughout the whole city. It is a long weekend holiday break too. La Castanyada is Barcelona’s Halloween, taking place on the 1st of November - All Saints Day. Enjoy tasty treats, like local wine, castanyes and panellets (more food information coming below). Have fun with your Truco o Trato this Halloween! Catalans know exactly how to make the most of each season. This extends to every part of daily life – especially with food. Catalan food has its own differences from the rest of Spain – By getting to know traditional Catalan dishes, you can tap into the Autumn flavours. One of the best ways to do this is to seek out a traditional Catalan restaurant and explore the menus. Bolets (wild mushrooms) – This is a great time to find local mushrooms in your markets. Simply fry with garlic and olive oil for a tasty treat. Castanyes (roasted chestnuts) and Moniatos (sweet Potatoes) – Buy a dozen chestnuts (una dotzena) from the local street vendors at a great price. Join in on the traditional day known as castanyada (31st october) where you will see local families buying these to munch together. Panellets (small sweet cakes) and Moscatell (Catalan sweet wine) – A nice combination to try and a delicious treat for anyone who has a sweet tooth. Calçot (green onions) – November is the season where large thin onions are grilled in an open fire. You will find it all over Catalonia – Calçotada is a festival in Tarragona, Cataloni, where the harvest is celebrated. Dip them one by one in romesco sauce (made of tomatoes, almonds, hazelnuts and olive oil), accompanied by red wine and bread. There are food festivals all year around – but I prefer to go during this season to enjoy and support local food businesses. There is something for everyone’s taste. Mostra de Vins i Caves CAT – This is a festival that celebrates Catalan wine, showcasing the very best that local products from all over the region. Mercat de Mercats – This is a joint celebration of various main markets around Barcelona coming together. Come and enjoy tastings, lectures and demonstrations with leading chefs from around the country and from stallholders from different markets of the city. Greenmood Bazaar – The meeting point of brands, projects and people who share the same vision: Sustainability , ethics, fair trade and proximity , ecology, up-cycling … A market that promotes positive initiatives in a relaxed family atmosphere. Want to experience the best of Barcelona? This guide is for you! No matter when you visit this magical city, you're likely to fall in love! Fall in Barcelona is great for your pockets and your sanity, but all year round, Barcelona will steal your heart! Enjoy your Autumn trip to Barcelona! Want to make sure you make the most of your time in BCN? This all-inclusive guide is everything you need to experience the city like a local! Thank you! This is the start of something magical! Tera Kaur is an African-Spanish life-long traveller and TCK (Third-Culture-Kid), growing up in different countries. Working as a yoga teacher and holistic therapist (Tera Kaur Yoga), she is currently based in both London and Barcelona. Healthy natural living and travel is her true passion and she loves to share this in her blogs OM Barcelona and Holistic Locs. Korean Skin Care for Black and Brown Women: Is It Safe to Try?